Public Relations -PR. Theory and Practice. 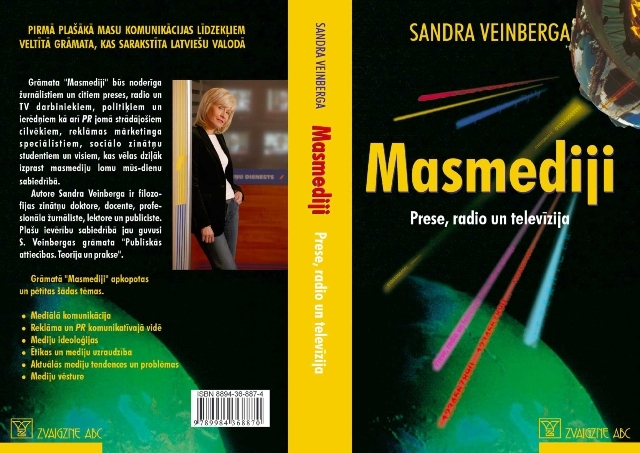 En omfattande bok, Massmedia, har författats av Baltic Medias föreläsare Sandra Veinberg. Utgiven av förlaget Zvaigzne ABC. Boken Massmedia är den första omfattande monografi på lettiska, som tillägnats massmedia. Den är både en encyklopedisk bok som omfattar masskommunikations huvudteorier, historiska fakta om massmedier i hela världen och en bok som ger en analytisk inblick i aktuella huvudtendenser och problem. Monografin är intressant både för journalister och övriga medarbetare i press, radio, television, för specialister i public relations, reklammarknadsföring, för studenter i sociala vetenskaper och alla som önskar att få djupare insikt i massmedias roll i dagens samhälle. I boken finns en sammanfattning på engelska. Freedom of the media in an independent Latvia has not yet reached maturity, but even so it has been saturated with changes and revelations. Just twenty years ago to publish a book such as this in the Latvian language was unheard of, because the media came under the USSR Communist party’s scrupulous observation and every word was meticulously censored by the censorship body. During the Soviet occupation newspapers, magazines and books were published, radio and television broadcasts were aired, however, every word, sentence, recording or film was censored by entrusted followers of the communist party’s ideology, because the media was the party’s main means of agitation, propaganda and organization. “Collective agitator and propagandist” – thus, in short and plainly the media mission was defined in Soviet media educational books, which on the whole were only published in the Russian language. The Russian speaking media was an example to all; in copying it one could hope for recognition from leaders and ideological supervisors. Therefore, also in practice the word “media” was never used, but in its place was used an abbreviation, comprising four letters, MIPM – “mass information and propaganda means”. Not a single Party ideological media supervisor was in any doubt that “a mass is a mass”. The masses “don’t know what they want” and therefore the MIPM was necessary, to steer the inhabitant masses towards ideologically correct thoughts and actions. “Information” was completely censored and journalists had no opportunities to gather, classify or select that material which rationally seemed valuable or essential for the audiences. Selections were made by the ideological leaders and censorship bodies, the journalist was needed just for implementation – to present the Party ideology’s chosen material for newspaper pages, radio and television broadcasts. “Propaganda” as a concept and purposeful action was also included in the magical abbreviation content and none of the ideological leaders shied away from using either the word or cynicism in its use. “Means” is an apt characterization for the media in direct control of the Communist party ideology. On a larger scale, this definition could also be applied to journalists themselves, who in their work were forced to battle every step of the way with the sabotage of foolish ideology, a battle for the use of intelligent material, placatory and biased commentary reduction, because those journalists who worked in MIPM Soviet occupation times also felt it important to work as “cleanly” as possible in their field. USSR journalists comprised of all kinds of people, just as in other professions. Creeps with hunched backs and submissive looks in front of the authorities. However, there were also people who even in these dark times entered world journalistic history with truly outstanding achievements (Estonian TV journalism broadcasts, Hugo Diegs at Latvian TV, Jury Senkevich’s traveler club at Soviet Central TV and others). Throughout the 50 years of occupation in Latvia and elsewhere in the Warsaw bloc state zone it was necessary to struggle with the USSR ideological father and absurd ideas, proposals and orders. However, that the journalist profession managed to produce intelligent work at this time was a heroic act, which today seems more like a mission for the good of the people, not just work. Following renewed independence, fundamental reorganization took place in all areas of the nation’s lives. The field of media also changed. Journalists had to transform themselves from occupied state court jesters into free and independent information carriers, taking on a difficult and responsible task – to ensure the continuous State democracy process. For this, the journalists needed not just responsibility, energy and a feeling of obligation towards their work and in front of their fellow citizens, it was also essential to observe professional ethics and acquire professional skills in line with liberated media requirements. Western colleagues helped with courses and lectures, but until now no big books on media and journalist work ethics has been published in the Latvian language. This book is the most voluminous media theory and practice research to be published in Latvian. Hopefully, along with existing media literature comprising translated works from English, Swedish and German; this book will help colleagues in Latvia to take a comprehensive look at the area of media and within it continuous modern processes. In Latvia, journalists are trained in a number of universities, however quite a few media employees enter this field of work from other professions. Therefore, a handbook such as this will help these people to familiarize themselves in more detail with developments in the area of media, because while carrying out daily work in editorial offices there is little time left to think about where and how Press, radio and TV is advancing in its development. Currently in Latvia there are no periodicals published dedicated to discussions on the theme of media. There are no active journalist organizations that would incorporate journalists and arrange topical discussion seminars, such as, for example, the Swedish Publicist club. Therefore, the publishing of this book may possibly stimulate new media employee discussion activities. The book comprises seven chapters. The most ample of these is the first chapter, which takes a look at media communication. Such in-depth analysis of this theme was essential, to explain the actual difference between correct mass communication or media in democratic community circumstances, as opposed to the Soviet “MIPM” work principles. Because not one of these Soviet media attribute components “mass” + “information” + “propaganda” + “means” functions in a free and democratic media environment. The text introduces readers to a number of Western communication models. The origins of the word “media” are explained, validating why the media should not be called “MIPM” or “communication means”, which is a phrase invented by independent Latvia’s language experts for describing the media. Media communication defects and effects are analyzed, clarifying that “background noises” are completely different in nature as it once appeared by Shannon and Weaver, because the determining factor for understanding information is information’s setting. Redundancy and entropy are some of the methods used for polishing the shape of information. The lack of feedback in the media is looked at widely, and the paths which media use to secure this feedback are analyzed. The pace of the information supply process is analyzed. A separate chapter is dedicated to the history of world media development, media culture imperialism processes and relations with PR and media. A summary of leading media theories (authoritarian, freedom, Marxism and socialism ideologies) and media regulatory law development in several countries is provided. Turning to the declaration of Press freedom is a very important theme, because in Latvian history there is no obvious charismatic Press freedom idea declaration, which is explainable by the presence of uncountable powers in occupation, however this is not excusable today, when in the name of the nation and patriotism, freedom of speech indicators are arranged according to other matters. Freedom of media is a democratic gain, however psychological inheritances from Soviet times often pulls back rule writers in the direction of authoritarian media ideologies. Of importance is the observation of ethical regulations, because free journalism also means taking accountability and liability on one’s own shoulders, not as in Soviet times when it was the responsibility of leaders and ideologists. A portion of journalists in Latvia are still unclear that it is wrong to work as a journalist in the media and at the same time receive a second regular income as a PR consultant offering services etc. A portion of journalists do not understand that such behavior is unethical, because they do not understand the difference in media and PR’s mission in modern society. The book widely uses Swedish examples for all issues, because the author lives and works alternately in Sweden and Latvia. A look at the history of world and Latvian press is fairly extensive, examining the evolution process of printed media from the first handwritten newspaper to the world’s leading conglomerate influence on the modern day media market. An explanation of newspaper classification and mass press work principles seems to have been important to the author. A brief look at the current newspaper scene in Northern countries, Great Britain, France, Italy, Germany, USA, China, India and others is also included. Similarly, the disappearance of political newspapers, the emergence of gutter press and evolving tabloids and tabloidization as a process is looked at. Several sub-chapters also review journals, the different types, classification principles and the newest trends in the area of journal development. Radio, TV and IT history is looked at amply, viewing Latvian television and radio history within the context of the process of development of world media. Public and private media comparisons also appear important, because in Latvia, just as in other “new” countries, there is no public service media tradition such as, for example, in Sweden or Britain, which also explains public confusion at a time when “the State starts asking for money”, licenses for radio and TV use. News journalism is the next most important stop-off point, clarifying the news stream process and selection criteria, which in post-Soviet zones for state journalists is not on its own an understandable process. The book introduces news service work ethics, news selection criteria and proposes implementation of regulations, to correspond with the world’s best systems developed in media practice. Also examined are related themes to the work of journalists, including clarification of what is neutrality, objectivity, censorship oppressors in modern times, how to treat lobbyists and other themes that are topical in both world and Latvian media practice. A separate chapter is dedicated to media for the public, its research opportunities and aspects which journalists may use in their creative work. The book finishes with an attempt to outline future media development opportunities, with the hope that Latvia’s media will also provide its contribution to this work. „The Visualisation of News Reports: A Comparative Analysis of Newspapers in Seven Different Countries – Myths, Identities and Culture”.